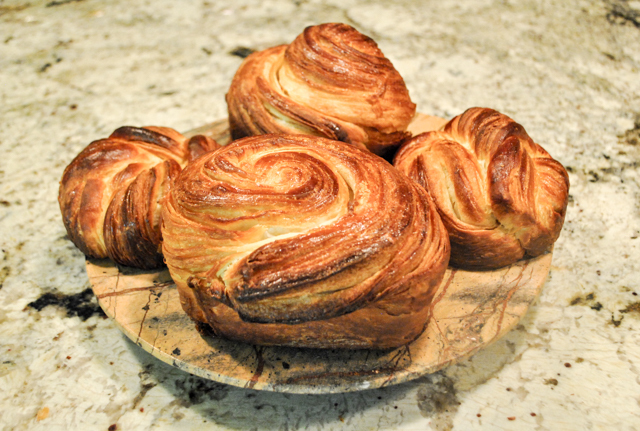 A special thank you for Gary, Patissièr Extraordinaire, for suggesting this type of post. 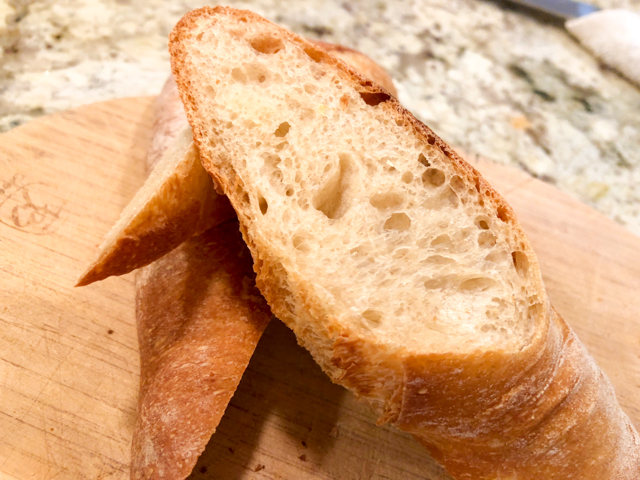 This bread is made with a very simple dough. 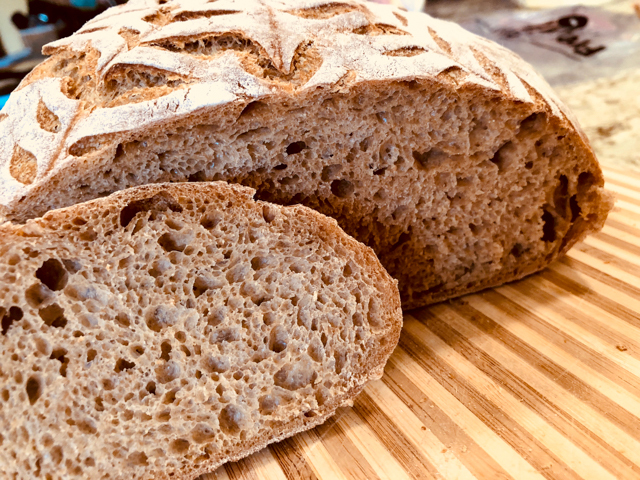 No wild yeast, no extensive cycles of kneading, just your trusty commercial yeast, a few minutes in the Kitchen Aid, and a nice sleep in the fridge. 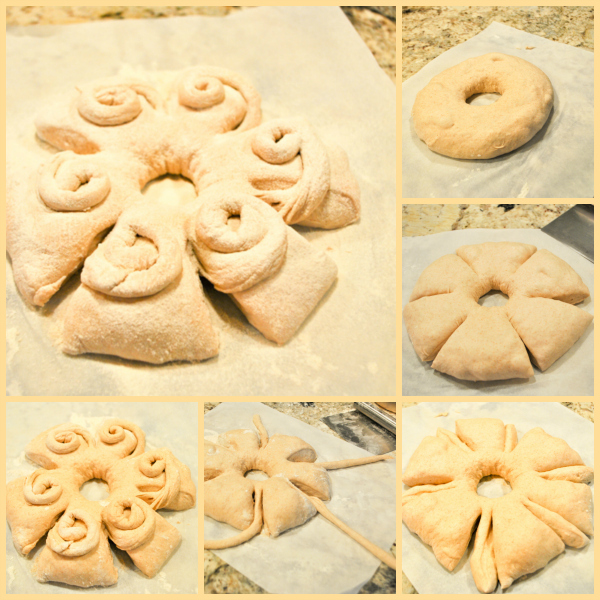 It’s all about the shaping, that results in a flower-shaped bread. Think daisy. 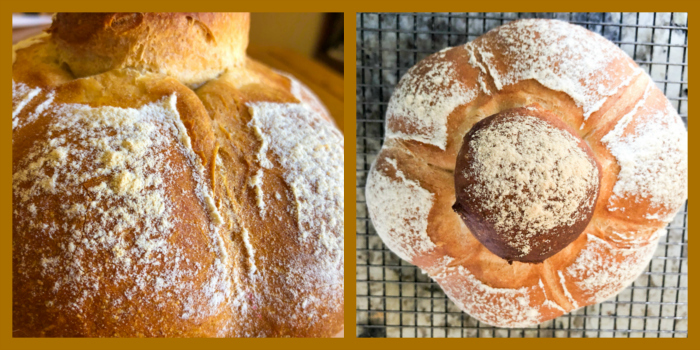 But both times I’ve baked it, the oven-spring was so spectacular that I thought I had made a brioche instead. 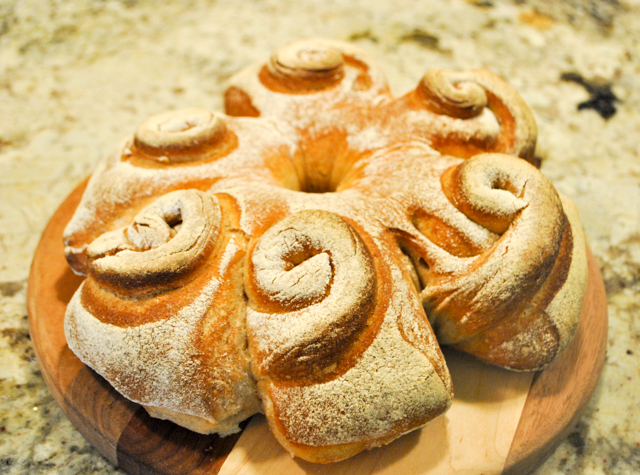 Mix all the ingredients on low-speed in a stand mixer fitted with a dough hook. Start at low-speed for a couple of minutes, increase to medium-speed and mix for 6 minutes more. 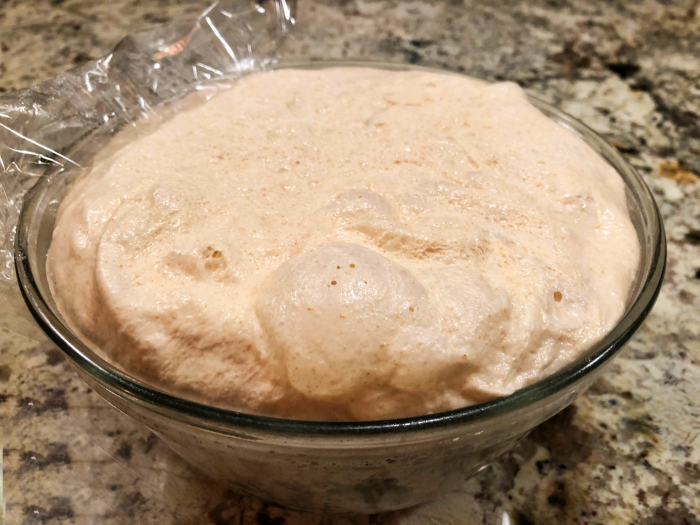 Transfer the dough to a lightly oiled bowl, cover loosely with plastic wrap, and leave at room temperature for 30 minutes. Place the bowl in the fridge overnight, but after two hours, punch the dough down, and cover again. 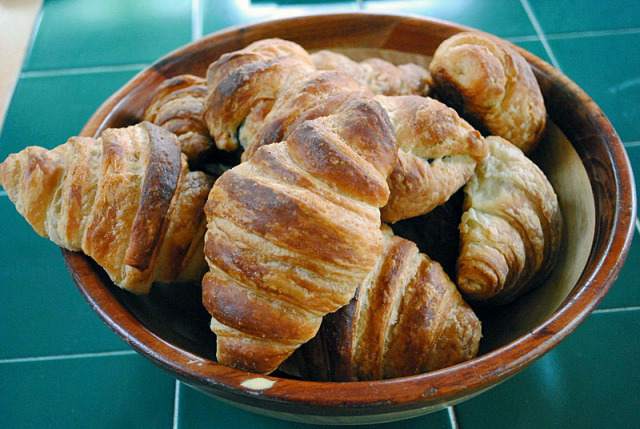 Next morning, remove the dough from the fridge and let it sit at room temperature for 30 minutes. 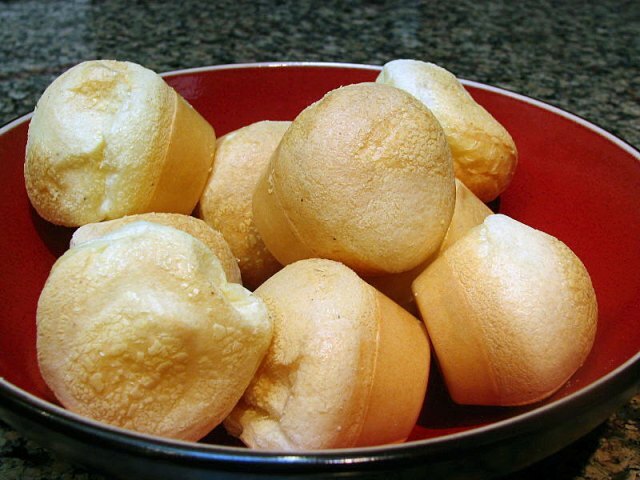 Remove a small portion of about 35 g of dough and roll as a ball. 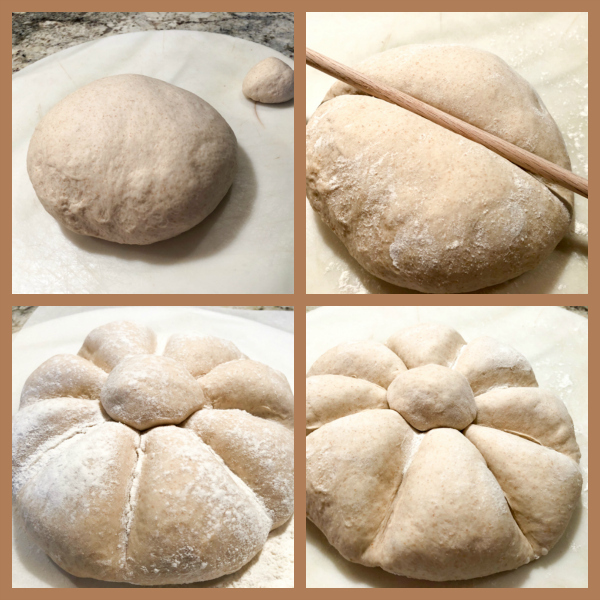 Shape the rest of the dough as a large ball. Use a wooden dowel to press down the sections of a daisy flower. Add the small ball to the center. Sprinkle a nice coating of flour, and let the dough proof for 60 to 90 minutes. 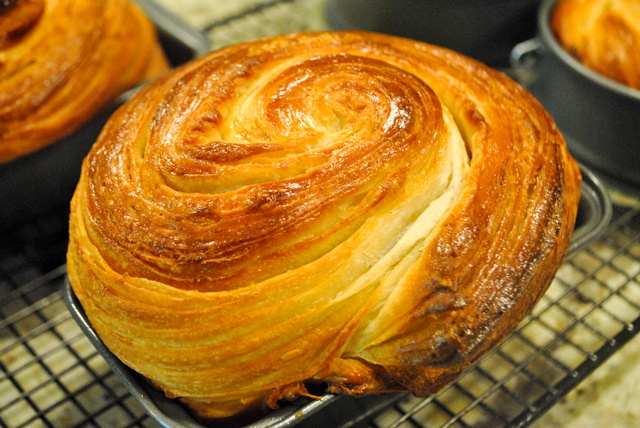 Bake at 470 F in an oven with initial steam for 30 to 35 minutes. Cool completely before slicing. 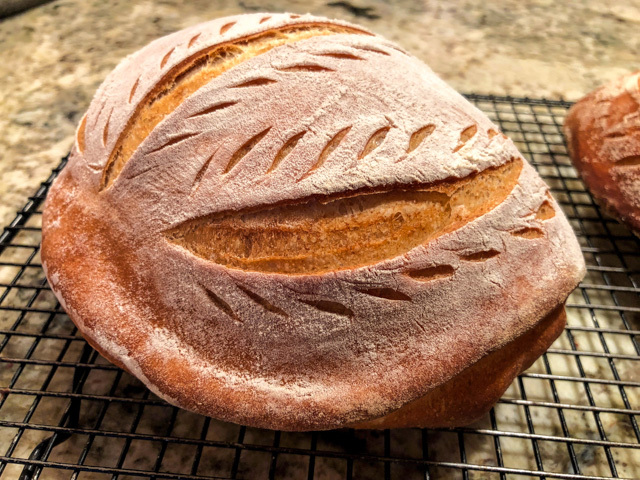 Comments: This is another nice shaping I learned taking the online class offered by Craftsy with Ciril Hitz (link under the recipe title, in case you missed it). 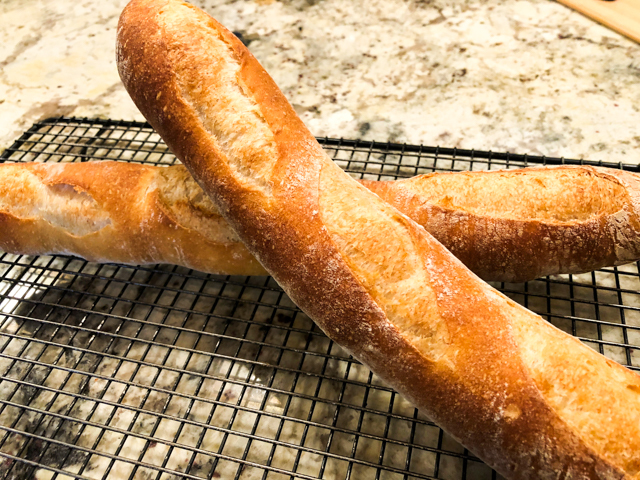 I still have one more bread from that class to tackle, but that one is a bit more involved. The Daisy shaping is simple and fun. 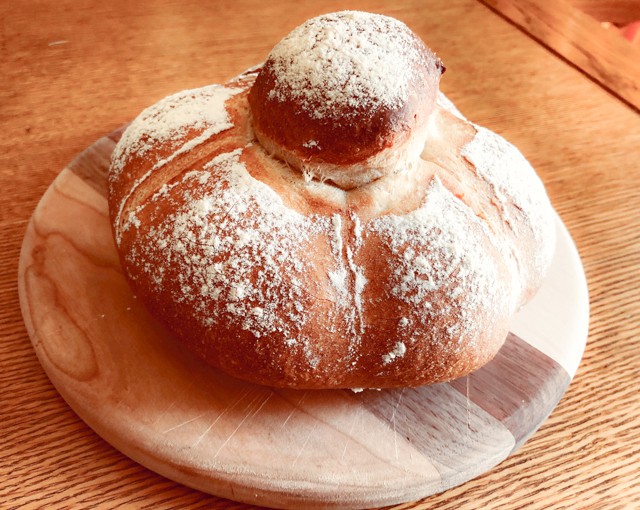 However, his bread was happy to be a flower, had no hidden intentions of imitating a brioche. He told me that perhaps a longer proofing after shaping would take care of that. I haven’t re-visited the issue. 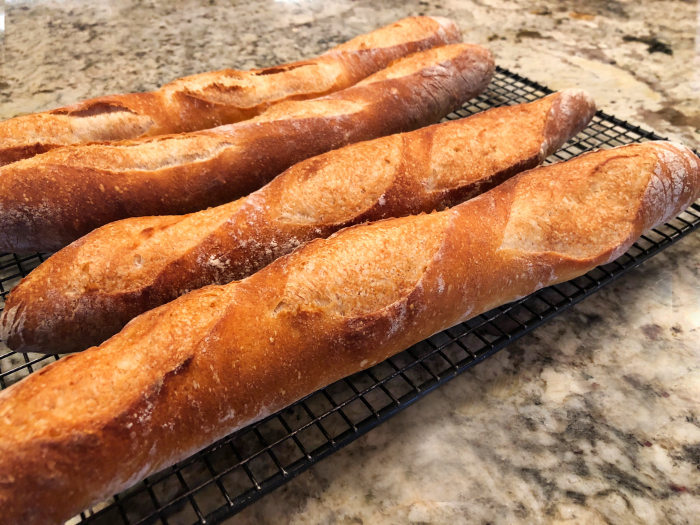 There are so many breads out there waiting for me…. But if you try it, keep that in mind. 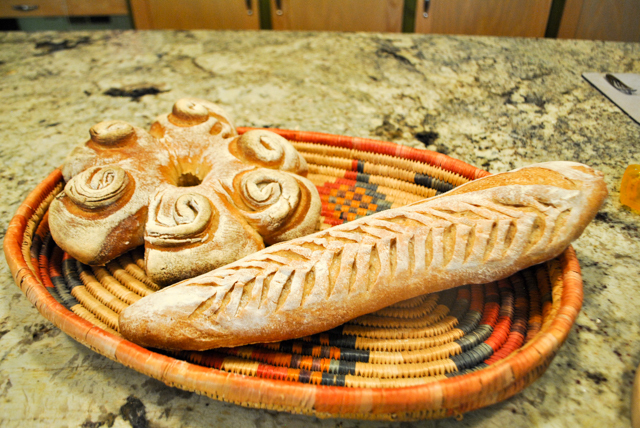 I love Ciril’s class, he has a very serene personality, which goes well with bread baking. Come to think of it, it’s a bit of a stretch to apply serene to my own self, but that might explain why you don’t see me making videos of what happens as I bake. If you are over the fence about getting Craftsy classes, give them a try. I think they are fantastic. Just make sure you read the reviews about each one. Also, they often have specials with huge discounts. I wait for those before indulging. SEVEN YEARS AGO: Goodbye L.A. It is amazing how one can be a foodie (for lack of a better term) and still find “new” food items to dream about. 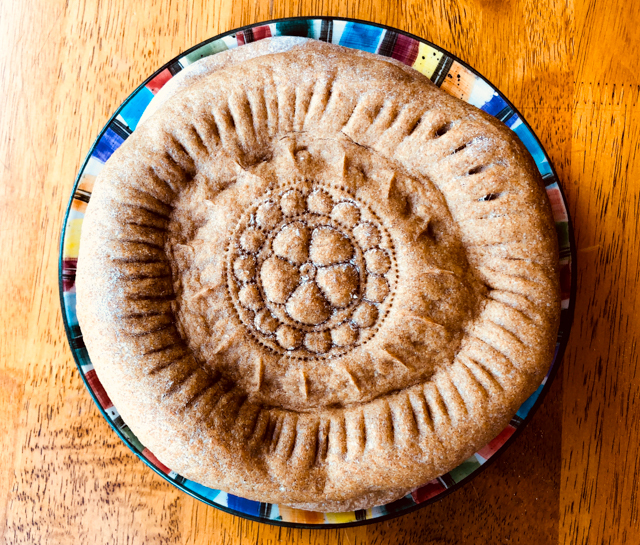 Like the traditional bread from Uzbekistan, a fascinating country north of Afghanistan. 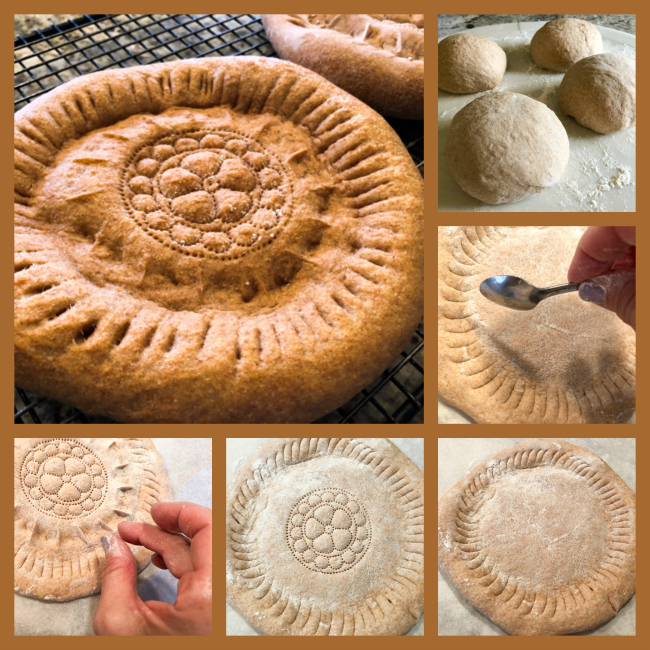 A couple of months ago I stumbled on this blog post and could not stop thinking about the beauty of those flat breads. 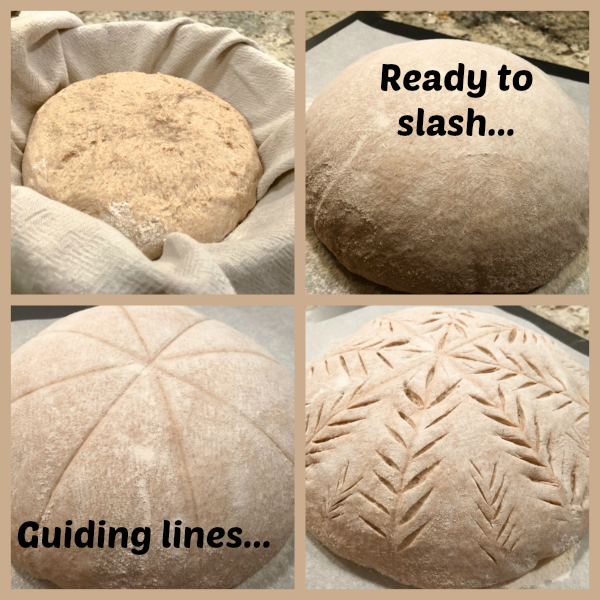 The dough can be very simple, although I found countless recipe variations for them. From type of flour to amount of yeast, duration of fermentation, type of fat added, it’s hard to find a common denominator. 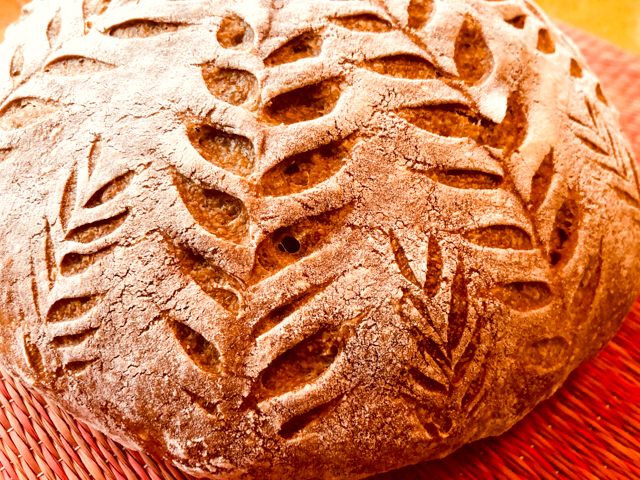 But the basic characteristic is the stamping of beautiful images on the dough right before baking. 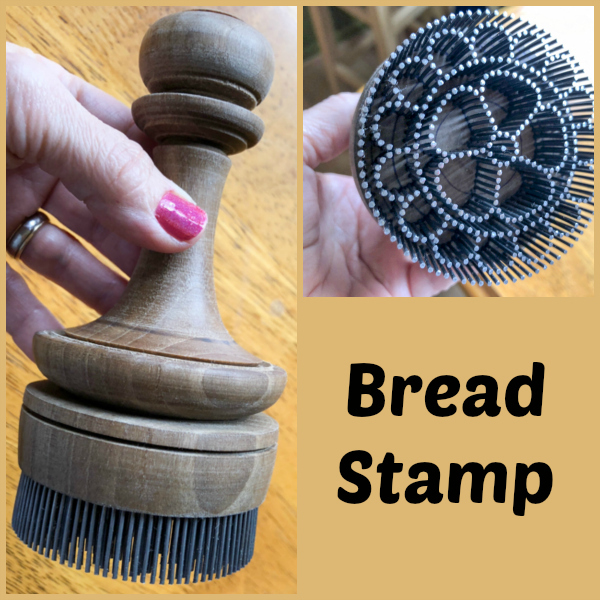 I found a beautiful bread stamp for sale at Etsy, and a few weeks later it joined our kitchen. I could not wait to try it! Mix all ingredients in the order listed in a bowl. 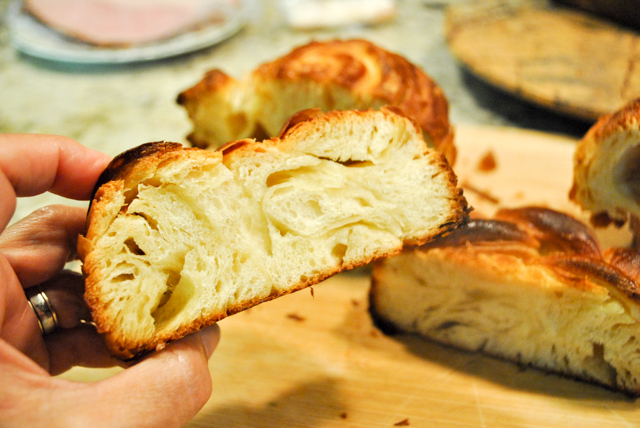 Knead by hand for 10 minutes, or if using a KitchenAid type mixer, knead at medium speed for 6 minutes. 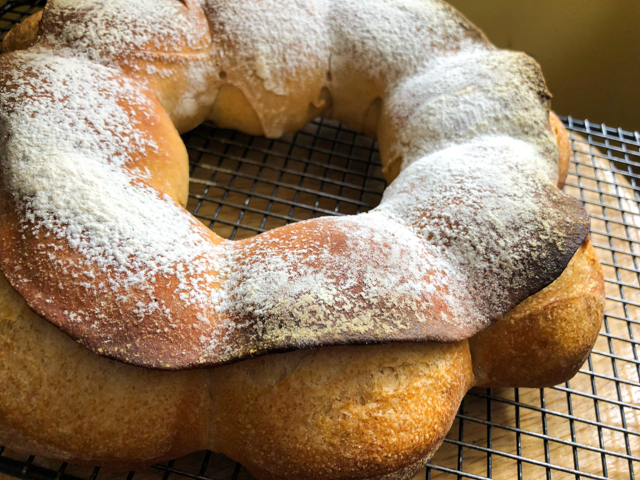 If the dough seems too slack, add more flour at this point. It should feel sticky, but hold together nicely. Transfer dough to a clean bowl lightly brushed with oil. Cover and allow it to ferment at room temperature for 2 hours. 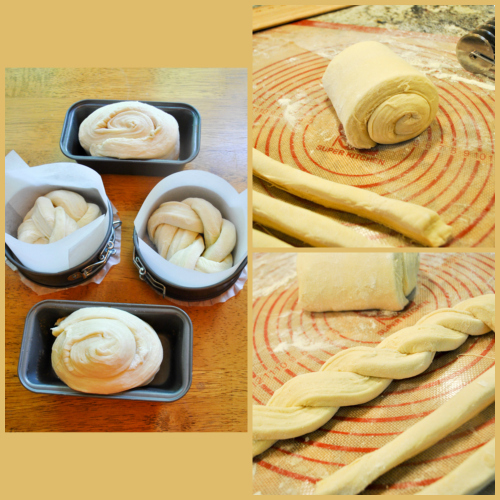 Divide the dough in 4 portions, shape each as a small ball. Cover and leave at room temperature for 5 minutes. Flatten each ball into a round. 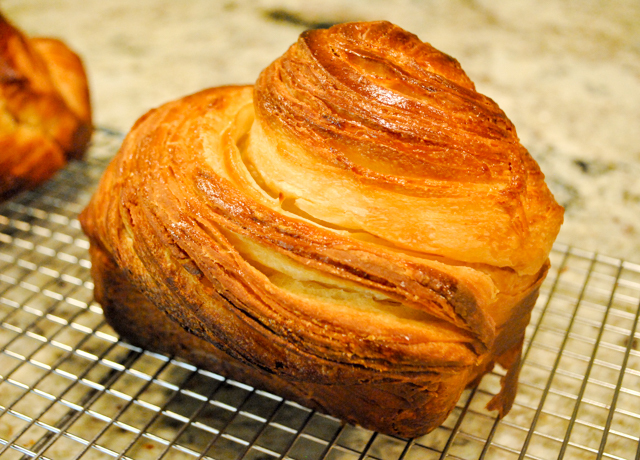 Press the center, forming a thicker layer of dough all around the perimeter. 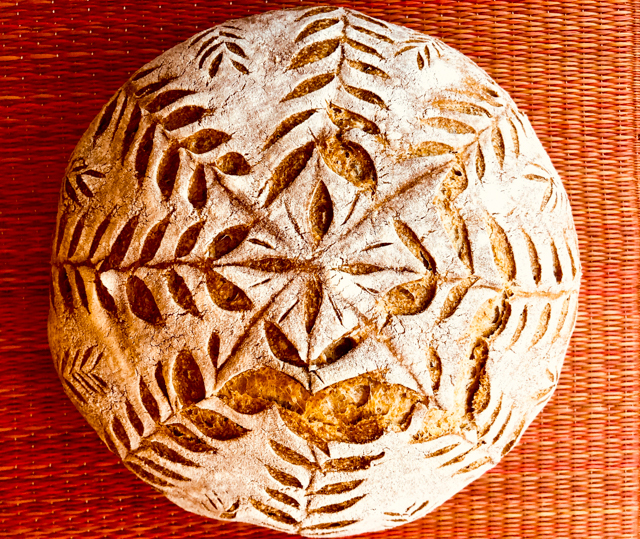 Use a spoon and a bread stamp to decorate the surface. 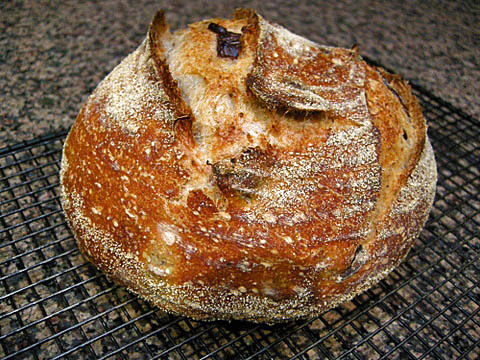 Bake in a 375 F oven inside a Dutch oven for about 20 minutes. Remove the cover after 10 minutes. 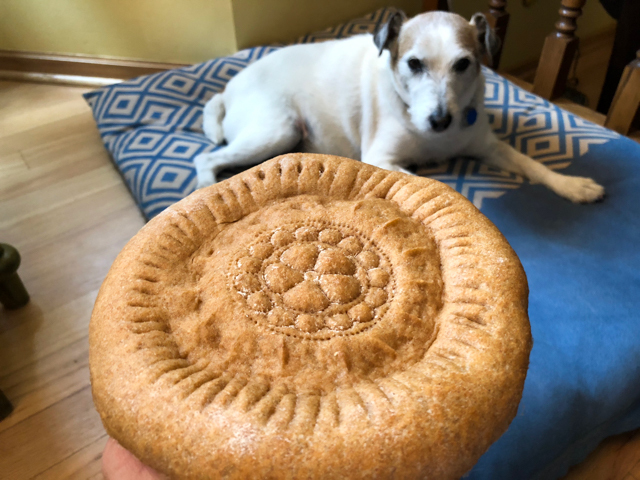 If you have a large enough Dutch oven, you can bake two at a time. If baking one at a time, leave the balls covered and make the decorations right before baking. 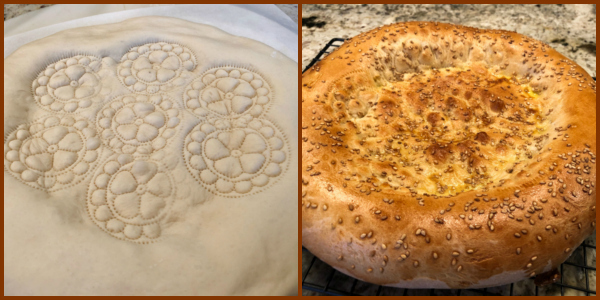 Comments: The recipe I am sharing is in fact my second attempt at making Uzbek flat breads. 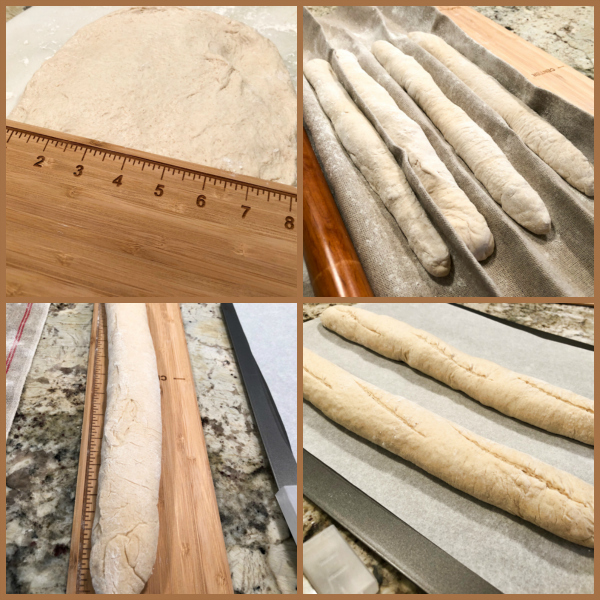 For my first adventure, I had not found a detailed recipe, it was more a vague set of instructions, so I made my own formula and used the fermentation time suggested. It contained quite a bit of yeast, and the proof fermentation was short, only 40 minutes. 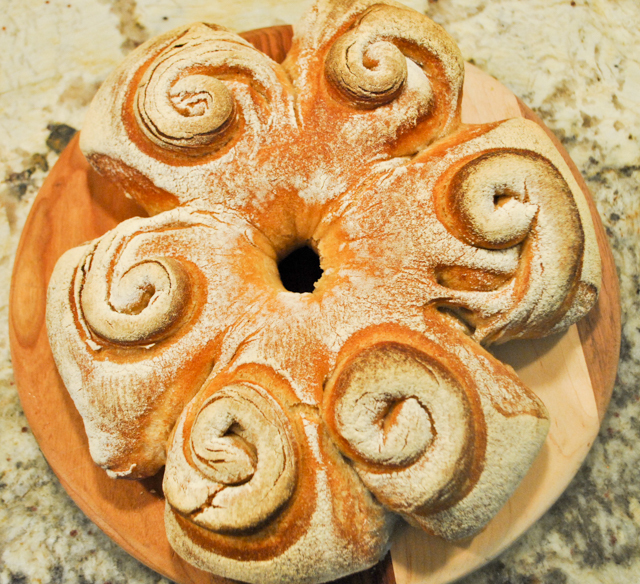 The result was a bread that rose so much during baking that the pattern of the stamp was lost. Below you see before and after pictures. I was a bit disappointed, even though the bread tasted pretty good. I wanted my pattern to show. I asked for help in a bread Facebook page, and got great advice. 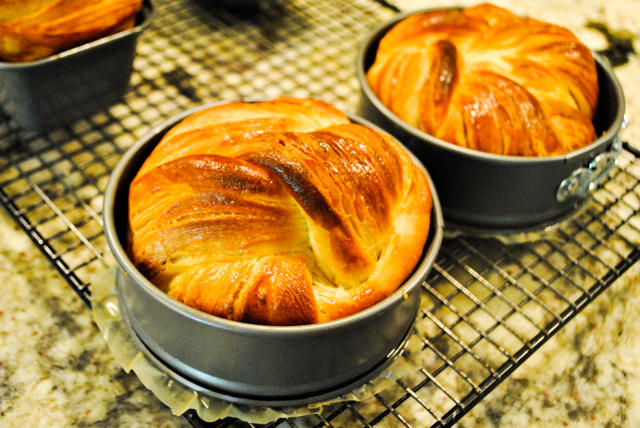 Including the link to that youtube video with the recipe I used. Worked like a charm! 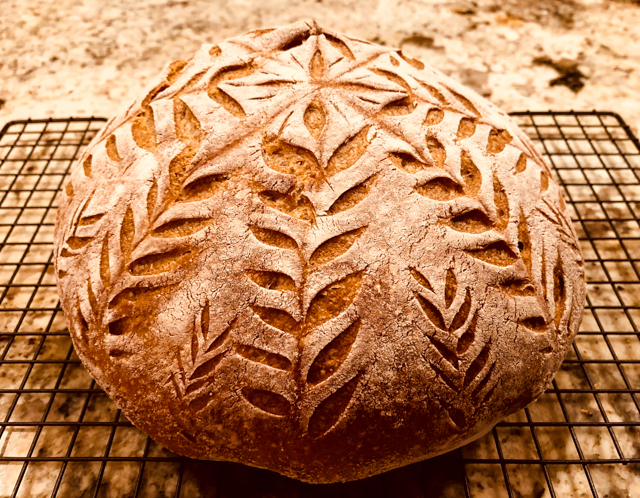 For my next time I intend to use 75% white bread flour and 25% whole wheat or spelt. I think it would make a nice texture, and probably need a little less flour during kneading. As to the decoration, you can do pretty much whatever you feel like it. I opted for the technique in the video. It uses a spoon all around the edge, then the stamp goes in the center. Next, you pinch the dough with two fingers around the stamp. 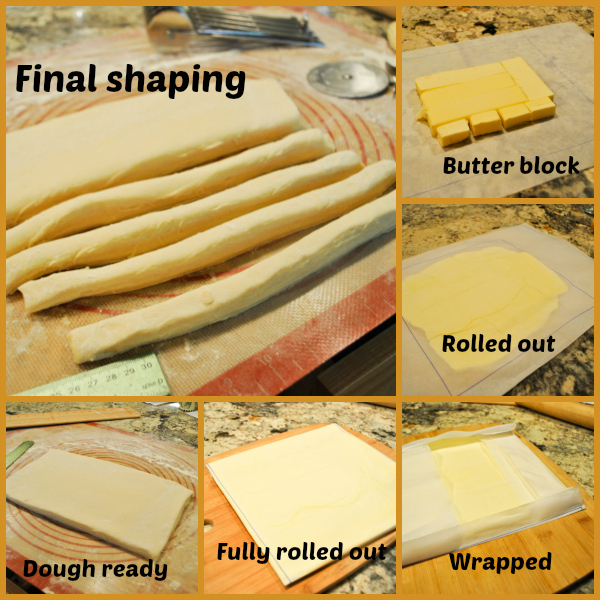 But you can do several rounds of stamps in the center instead, leave the dough plain all around. I imagine that each family has their own way to decorate their bread. 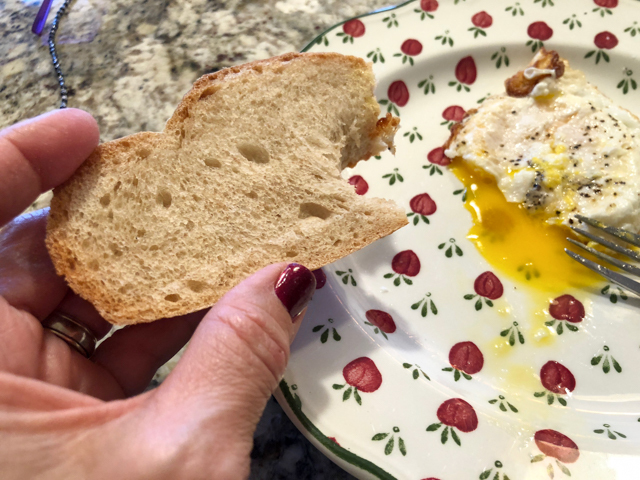 The bread was delicious with hummus, with goat cheese, and black olive tapenade. Sliced like a pita, it was fantastic to deliver fresh tomatoes juicy with a drizzle of olive oil and oregano. 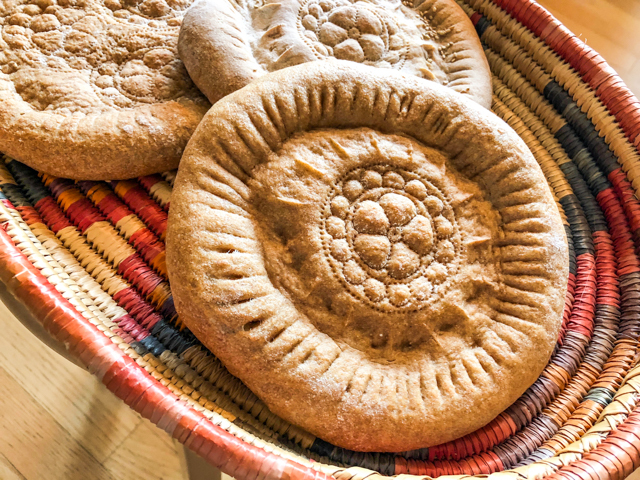 Since learning about Uzbek flat bread, also called Lepyoshka, I’ve been fascinated by that country. You can find some nice pictures of Uzbekistan in this link.